Simple-to-set-up full colour display system. 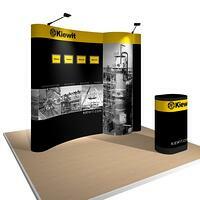 Pop-Up displays provide a vibrant graphic presentation that is simple to set up and compact for shipping. The Studio Pop-Up’s lightweight aluminum frame connects together with rare earth magnets in the hubs and on the self-aligning magnetic bars, making this system a snap to setup and take down. It packs into an oval shipping case which can be converted into a podium. 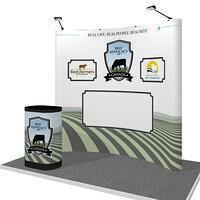 Two 150 watt spotlights and a laminate podium top are included with each unit. 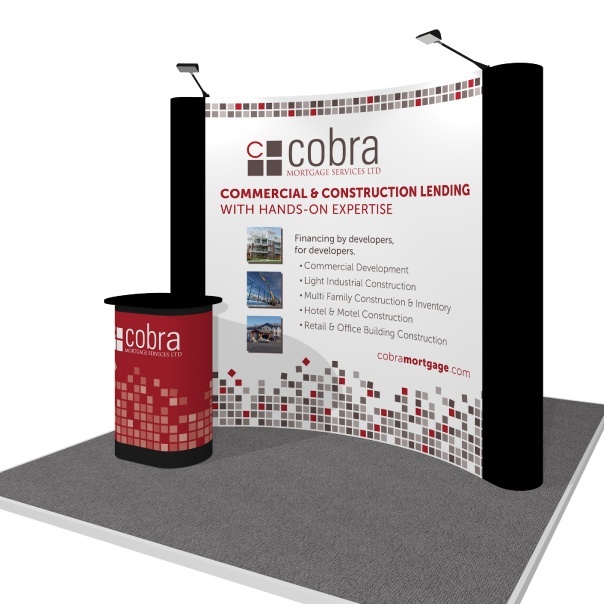 Our Pop-Up display is available in 8ft, 10ft, 20ft standard configurations and can be custom sized, in both straight or curved configurations. There are a variety of options available, including backlit logo cutouts, fully backlit panels, monitor cutouts, and magnet-on graphics. 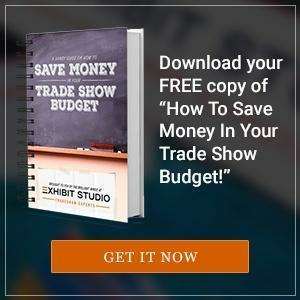 And to top it all off, we offer a lifetime warranty on both the hardware and graphics which makes the pop-up display the perfect portable display system for a 10x10 trade show booth. View the Gallery for more ideas! 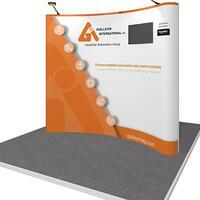 Printed to a white polyester film, our pop-up graphics are rich and vibrant. Our carefully chosen face laminate is textured—reduces glare without dulling the graphics—and an 11mil light-blocking back laminate reduces any visible shadowing through your display. Order a free sample! 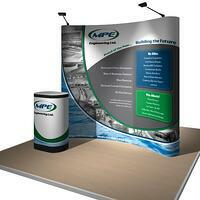 Once your graphic panels are printed we can cut out your logo and attach a printed backlit panel behind the graphic. We then mount LED lighting to the pop-up frame and attach a back panel to contain ambient light, making your logo backlit and eye-catching. We can also print an entire graphic panel on our backlit material, which attaches to the pop-up frame just as a standard graphic panel does. With three lights attached to the frame and a back panel to contain ambient light, the effect of a full backlit panel is stunning. 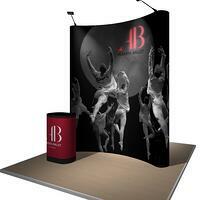 When you choose to incorporate fabric into your pop-up display—whether you choose to have all fabric panels or by incorporating fabric panels into a partial mural layout—you add the ability to attach Velcro-On graphics to your display. These graphics are printed to our standard, high quality pop-up material with Velcro along the back so you can swap your messages on and off your fabric sections. For a fabric in-lay we print your pop-up panels in full colour and then glue on a section of fabric (in almost any shape or size) to the graphics. The panel breaks remain intact, so your display will setup and take down just as a standard pop-up would—but a fabric inlay provides that full graphic look with the option for interchangeable velcro-on messages. 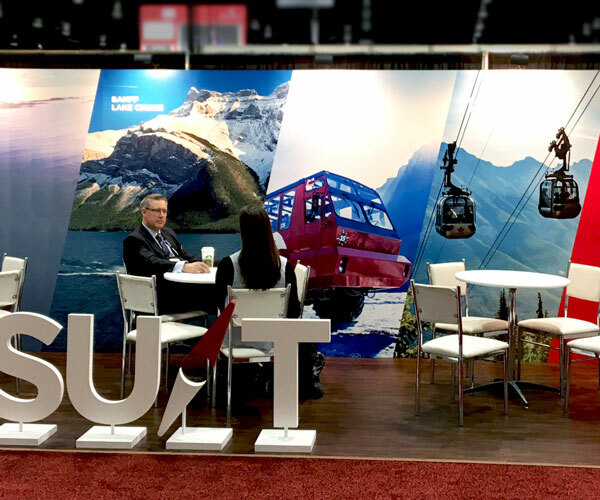 When you want to incorporate interchangeable graphics on your pop-up display, but love the look of full length graphic panels, look to magnetic options. These magnetic graphics and panels make it easy to change out different graphic messages out on your popup display whenever you want, while still maintaining the look of a full color graphic display. With a monitor mount attached to the pop-up frame, we can cutout a section of your graphic or fabric panel and situate your monitor inside the frame. This seamlessly incorporates your video presentation directly into your pop-up display, eliminating the need for a separate monitor stand in your booth space. 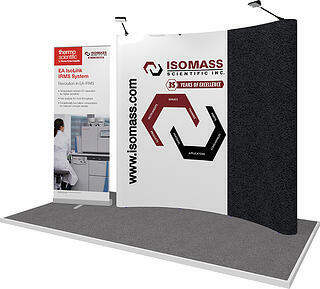 Displaying product can be a challenge to incorporate into a 10x10 display booth while still maintaining portability. The Studio Pop Up's frame can be modified to fit three internal shelves in it to display lightweight products. The shelves will still fit into the oval shipping case for transportation! 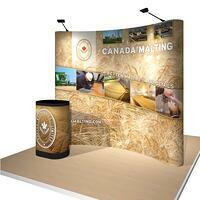 A table top display is an excellent chance to add in a dynamic presentation to your booth. 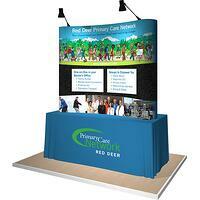 Whether you exhibit at career fairs, chamber and association events, or at trade shows, a table top display gives you ease of shipping and set up. For an added bonus, some can be accessorized with lighting, monitors and more! 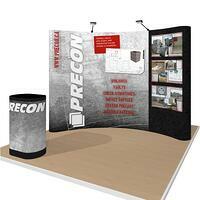 Our pop-up hardware can be altered to fit your needs. Customize your hardware by changing the width and height to fit the space you want. Check out the Pop-Up Gallery for inspiration on what you can do! Our pop-up hardware comes with a lifetime warranty on the alumium frame, and magnetic bars. 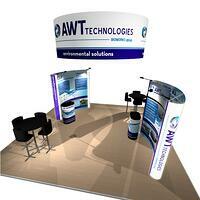 Our high quality graphics also have a lifetime warranty against fading or delaminating. They are extremely durable, easy to clean, and will not rip or tear. 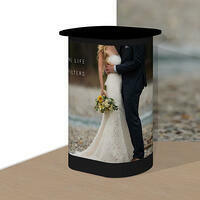 The mural podium conversion kit includes a full-colour, laminated print that wraps around the shipping case and velcros in place at the back. It’s completed with a woodgrain, black or white laminated podium top. 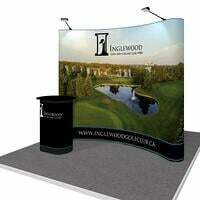 All of our pop-up displays, including the 20ft configurations, are available to rent either with fabric panels (attach your own velcro compatible graphics) or the purchase of full length mural panels (in which case the first rental is free). Our rental rebate program means you’ll get 75% of your money back if you choose to buy within 30 days. 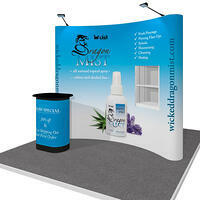 Is a Pop-Up Display right for you?